Touch biblical Jerusalem! Israel’s Western Wall or Wailing Wall, built by King Herod, supports the huge Temple Mount platform over Mount Moriah where Solomon’s Temple stood. Ask Zack Shavin about visiting and even celebrating your Bar Mitzvah or Bat Mitzvah there! Imagine a piece of ancient Jerusalem, so authentic, so well preserved, that what you see today is exactly what was seen by the local people and tens of thousands of Passover pilgrims that made their way up to the great Holy Temple 2000 years ago! It is called in Hebrew the Kotel Ma-aravi or Western Wall, and is a perfectly preserved remnant of the massive outer retainer walls that encompassed the Temple itself. Originally over 1500 feet long and 100 feet high, the Western Wall was one of four incredibly massive walls that not only protected the Temple, but also supported a massive platform which covered an area equivalent to 15 football fields and upon which the 200 foot high marble and gold Temple stood. Wasn’t the Temple destroyed by the Romans? Indeed, the Temple building itself – considered one of the wonders of the ancient world – was destroyed by the Romans in the year 70 A.D. But the platform upon which the Temple stood, covering an area of 15 football fields, and the outer retainer walls, were preserved. It was just too massive to totally demolish. The smallest of the stones in the Western Wall weigh 3 tons each, the largest about 500 tons- as much as 10 fully loaded semi-trailer trucks! 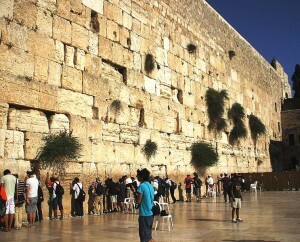 Why do we pray at the Western Wall? Why this spot? It is important to understand, that this place is Mount Moriahitself, where Abraham brought Isaac, almost 4000 years ago. About 1000 years after Abraham, King Solomon was given the privilege of building the Temple here, permanently replacing the desert Tabernacle. The Bible tells us that upon completing the Temple, ruach elohim- the spirit of God- filled the House. Otherwise it would have remained just a beautiful man-made building. In other words, the Shekinah- the Divine Presence- is intimately associated with the area. Indeed, the Temple is called “Beit HaMikdash” in Hebrew, which means “House of Holiness”. God is pure holiness; divine holiness came to rest here. God, Yahweh- HaShem- chose this place- it is unique in all the world! Two thousand years ago Jewish people prayed at the Temple itself. Today, the gold-domed Mosque of Omar stands over the spot and is closed to non-Moslems for prayer purposes. While we cannot pray on the Temple Mount itself, we can do so at the Western Wall. There we literally touch a remnant of the Temple complex and connect with our roots, faith, and heritage. For more info about visiting Jerusalem’s Western Wall (Wailing Wall) built by King Herod around Mount Moriah and where Solomon’s Temple stood, please contact Zack Shavin, veteran Israel guide and biblical archaeologist at Land of Israel Tours. Also inquire about Bar Mitzvah and Bat Mitzvah ceremony arrangements at the Western Wall. This entry was posted in Jerusalem and tagged Bar Mitzvah, Bat Mitzvah, Jerusalem, Mount Moriah, Solomon's Temple, Temple Mount, wailing wall, western wall by zshavin. Bookmark the permalink.